Bet Bet was the name of a rural village and of a shire, both on the Bet Bet Creek which joins the Loddon River at the Laanecoorie Reservoir. The administrative centre of the shire was Dunolly, which is 50 km west of Bendigo. Bet Bet village is eight km south of Dunolly. The name is thought to have been derived from an Aboriginal word meaning place of red ochre. (The red ochre mine, however, was on a different creek from the Bet Bet.) The name was first given to the creek, and then to a municipal district (1861) which became Bet Bet Shire on 20 September 1864. 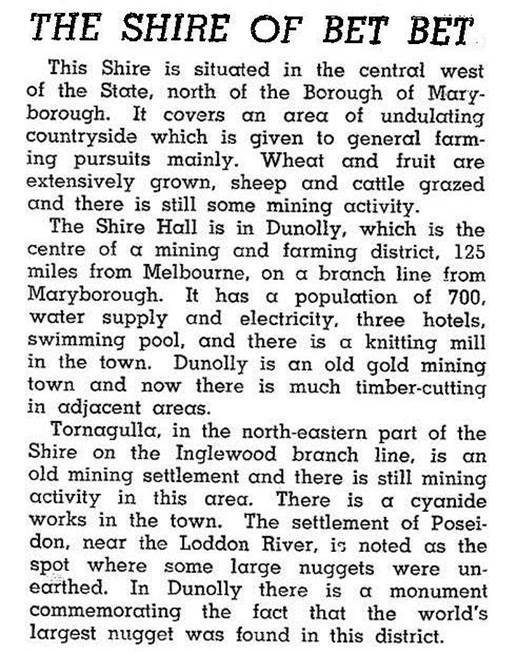 Until 1915 the shire enclosed Tarnagulla borough, and until 1921 it enclosed Dunolly borough. Those boroughs were united with the shire when their populations declined with the passing of the gold mines. Both had been the centres of very rich gold fields. Bet Bet village on the creek is an agricultural district, and was known first by the crossing place, Dwyers Bridge. The Dwyers Bridge National school was opened in 1860, being renamed Bet Bet two years before it closed in 1877. A government school – first held in the Bet Bet Inn and named Bet Bet from the beginning – opened in 1876. A Presbyterian church was opened in 1863. Bet Bet village slowly shrunk after 1910. The school closed in 1948, the Church of Christ closed in 1974, the railway station was destaffed in 1976, and the general store closed soon afterwards. On 19 January 1995, most of Bet Bet Shire was united with Maryborough city and most of Tullaroop and Talbot and Clunes Shires to form Central Goldfields Shire. The balance of Bet Bet Shire went to Loddon Shire. 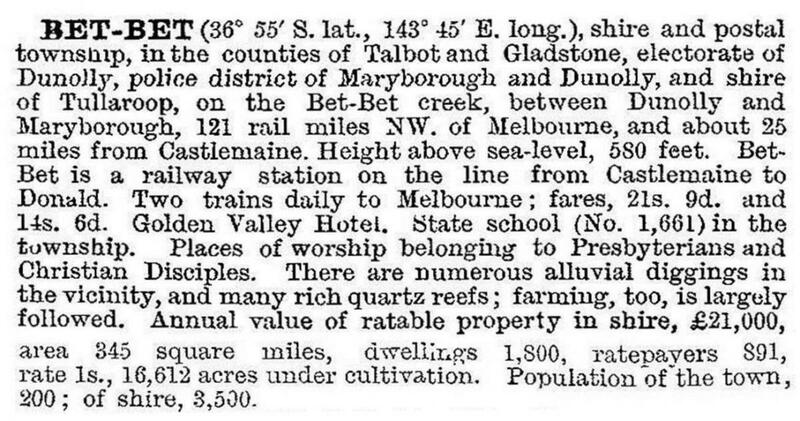 In addition to Dunolly and Tarnagulla, the shire included Bealiba and Newbridge. Its area was 928 square kilometres, of which 68% was farmland carrying 138,000 sheep and lambs and 2800 cattle (1994). Wheat (8400 tonnes) and barley (2400 tonnes) were also grown. Bealiba, Betley, Bromley, Dunolly, Goldsborough, Llanelly, Moliagul, Newbridge, Tarnagulla and Waanyarra entries. (All these places, except Betley and Newbridge, began with gold discoveries).